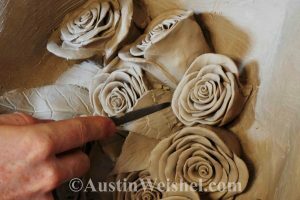 I had the opportunity to sculpt some roses today for a current project that I am working on. It was fun to deter my mind a little and have some fun with creating my own spin on these roses in different shapes and sizes. They are for a religious sculpture that shows Juan Diego kneeling before Guadalupe to give her the roses as he is the first one to discover her.